Whilst one cannot say with certainty when the Abbeydorney Hurling Club came into existence it is fairly certain that the game was being played in the Parish on a very wide scale even before the G.A.A. was founded in 1884. That the standard of hurling was very good is not in dispute because the Club won the first of its four Co. Championships in 1893. When one realizes that in 1891 our neighbours Ballyduff had brought to Kerry its first and only Senior All Ireland title in Hurling, it becomes obvious that Kerry Hurling during this era was as good as anywhere in the country. Indeed we are told that an Abbeydorney man, Dave Fitzgerald of Killahan was a substitute on that same Ballyduff team. Regretfully we have no record of the team which won the 1893 final but we do have the team that won the Championship in 1896, and we would assume that most of those who played in 1896 also played in 1893. The Club had to wait seventeen years before winning its next title (1913) and then the long gap of 61 years to 1974 for its fourth and last Co. Senior Title. Anyone who might think that this long wait for a Senior Co. Title signified a decline of hurling in the area would be completely wrong, because the records show that the club in the intervening years reached a good many Senior County Finals without achieving the ultimate goal. There, were, however compensations by way of North Kerry League Title and the great years of 1927, ’28, ’29, and ’30 when the men in Black and Amber were in a class of their own winning four North Kerry Leagues in a row. They were back again in 1936 for a further North Kerry League Title, a period which saw great teams in most of the North Kerry Senior Clubs. In 1947 the club started its first of three sessions in the junior ranks, the others being in ’51 and ’65, on each occasion the junior title was won and the club compelled to revert to Senior the following year. Since ’65, however the Killahan Junior club has continued to function and as in the history of the area has continued to produce its quota of fine Senior hurlers for the club. It is worth noting that on each of the occasions when the Senior Co. Championship has been won the team has been captained by a Killahan man. The year 1968 saw the North Kerry League title come to the club for the sixth time to date and most hurling enthusiasts are agreed that, had the team remained together they could have won a Senior Championship in ’70 or ’71. However, they broke up and it took another six years to get the right balance to break the sixty one year hoodoo. Rathmore, believe it or not was in 1918 the venue set by the Co. Board for a first round Senior Championship game between O’Dorney and Kilgarvan. The team travelled by train and we are told that apart from the teams and some few supporters accompanying them not another spectator turned up for the match. This was the period of hurling dominance by the Tralee Parnell’s and also the year for objections. O’Dorney met them in the final of the Co. Championship in September 1918’and won by a point. Parnell’s objected and a replay was ordered on the grounds that an O’Dorney player was illegal. This game was played in October 1918 and won by Parnell’s, again by the narrowest margin. O’Dorney then objected and a second replay was ordered because a Tralee player was illegal. This game was not played until March 1919 and victory went to Parnell’s rather easily because in the time between the first and second replays a number of the village stars had emigrated to the U.S.A.
Because of the freedom struggle the County Championship was suspended over the years 1919-1924, but during this period most clubs did play some challenges or tournaments. On the resumption of competition, in 1925 Tralee was a great power in County Championship hurling and remained so over the next half dozen years. However, the North Kerry League had also started around this time and it was the men in Black and Amber that dominated the scene in North Kerry. That the standard of the opposition was good cannot be argued when it is noted that the Causeway team ended the dominance of Tralee in 1932 to win their first Co. Championship. North Kerry clubs have since then monopolised the County Championship apart from one or two incursions in 1953 and ’56 by that hurling stronghold of the South, Kilgarvan. No summary of the clubs history would be complete without the mention of the many dedicated men whose work for their clubs off the field have in large measure contributed to the success of hurling in North Kerry. Down the years our own club has had its fair share of good fortune in this respect, and has produced men who have each in his own way helped to foster that special allegiance and pride in the local community which ensures continuity regardless of success. There are so many such men in the history of the club that it would be impossible in an article such as this to mention them all but we hope you will excuse us if we single out one man for special mention. For over forty years he has encouraged and helped every generation of youth in this parish and it is a great pleasure for us on behalf of past and present generations of youth to acknowledge and thank Mr. Maurice Fuller of Drumcunnig for that help on this historic occasion. Our under age teams must not be forgotten in this summary and down the years the club has produced remarkably good minor teams. For instance in the years 1955- 56 playing as St Patrick’s ( a combination -of O’Dorney and Kilflynn ) the team twice won Co Minor titles and in 1957 an entirely O’Dorney selection won another Co Championship. During this period also the Abbeydorney Minor Team won two North Kerry Championships in 1956 & 57 and the North Kerry League Titles in 1954, ’55, ’56. A remarkable feature of the Senior Championship winning team of 1974 was that Tom Kearney (Milltown) and Denis Shanahan were still playing with the club when that historic victory was achieved. All the other great minors of the mid and late ’50s were either retired or had emigrated. The club won the last of its Co. Minor Championships in 1971 and in that year also won the under 14 Co Hurling Championship. This under 14 team went on to represent Kerry at Feile na nGael at Thurles in July 1971 and acquitted themselves with distinction in the Birthplace of the G.A.A. A film of this event was available by Rev Fr McKenna (R.I.P.) then Curate in Abbeydorney. A red letter day in the history of the club was the A.G.M. of January 29th 1970 because it was at this meeting that it was keenly felt by the members that the lack of a permanent field of their own was regarded as a great drawback to our young sportsmen and sportswomen. At this meeting a small committee was formed for the express purpose of exploring the possibility of purchasing a field. The result of their efforts was the purchase in March 1970 of this present property at a cost of £2500.00. At the time the price was regarded as being rather high, but in view of the way prices have soared since then it can be regarded as well worth the money. At the time of the purchase the committee had no money so they had to set about the tedious task of fund raising, firstly to meet the purchase price, and then to tackle the development of the pitch. A house to house collection of the parish was carried out in the fall of 1970 bringing in a total of £800.00. Former members of the club scattered throughout the world were contacted and responded generously. A number of well organised carnivals were held and grants from the G.A.A. amounting to £1200.00 enabled the committee to pay off the purchase price and make plans for the development of the field. It was levelled, drained, ploughed, rotovated and rolled. Finally, on Saturday 15th September 1973, the grass seed was sown on the beautifully laid out pitch. The first Grounds subcommittee comprised of Brenda Dowling, the late Tom Healy, Jackie and Gerry Treanor, Ger Maunsell, Conor Kearney, Patrick Slattery and Frank Egan. We were busy in January 2006 putting the final touches to our first grant application form. Thankfully the hard and diligent work reaped the rewards when a few months later we were provisionally allocated €80,000 for the installation of a sand carpet pitch with formal approval coming through in August 2006. January 2007 saw our subcommittee submitting another application to the sports capital programme for floodlighting and once again thankfully we were successful when we were allocated €84,000. Realizing we still had a shortfall we decided to organize the first of the two Nights at the Dogs. A tremendous effort was put in by the hurling club members along with members of the Ladies Football club. There is no doubt but that a dog’s night is a fantastic fundraiser once the correct effort is put in. Every road in north Kerry was travelled by our teams of volunteers during many a cold and wet night. However it was well worth it in the end with the first Night at the Dogs at the Kingdom Greyhound Stadium on the 16th June 2007 realizing a tidy profit of €32,366. The pitch area was closed off on the 10th April 2007 and ploughed up. Allman contracts got to work and installed the intensive drainage system required, laser levelled the 4 inches of sand on the surface and reseeded on the last week of May 2007 having got perfect weather conditions. The following months of June, July and August were particularly wet and so suited a quick establishment of the new pitch sward. The pitch remained closed until July 2008. Tim Allman and Michael J. O’ Shea (Sports Turf Consultancy) kept a close eye on proceedings and the club would like to thank them for their invaluable work. A pitch irrigation system was also installed at this time at a cost of €17,500 with the pitch and training area costing €110,000. The next major undertaking was to install the floodlights. This involved a lot of preliminary work including obtaining planning permission. A field trip to Clare to see similar floodlights was also undertaken by Tom Healy, Pat Slattery, Ger Maunsell and Frank Egan. When we got to our destination we were impressed by what we saw. We installed similar floodlights in Abbeydorney pitch in May 2008. The cost came to €140,000 which included the 160 KVA generator. Our third and final application to the Sports Capital Programme in Jan 2008 was once again successful with the club receiving a grant of €45,000 towards a Training area, hurling wall and astro turf apron. Having been successful with the 2007 Night at the Dogs we took the risk of running a second one in the subsequent year. It was held on the 21st June 2008 and thankfully was a good success once again realising a profit of €25,600. 2009 involved the erection of the spectator fence, concrete pathways and the extension to the main car park. In January 2010 we began work on the Hurling wall, astro turf apron and fencing. It was completed in April. 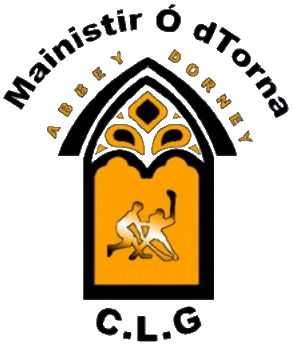 The club at this time received €20,000 from the Abbeydorney Sports hall Development Association as a contribution towards the cost of the hurling wall and we thank them for same. This project in total cost €45,500. The first six months of 2012 involved the completion of a new Gymnasium building and of course the spectator stand with the latter costing approximately €28,000. We have a fine Facility now. The sand carpet pitch is not an all-weather surface but it is a particularly efficient way of taking water off the surface quickly and once it is maintained correctly it will give many years of pleasure to Players from Abbeydorney and surrounding areas. The total cost of all projects to date came to €400,000. We are very thankful to The Sports Capital Programme, Munster council and central council for total funding received to date of €32,942. Also thanks to the North Kerry hurling Board for Grants received. As mentioned earlier we are particularly grateful to the people and businesses of Abbeydorney and surrounding areas for their financial support and to anybody who helped in any way to make these developments possible. 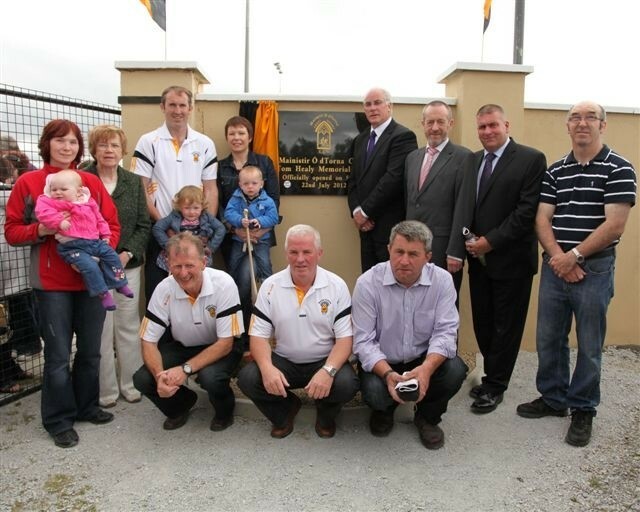 The official opening of Tom Healy Grounds took place on July 22nd 2012.